We recently got an opportunity to speak with the developers for Assassin’s Creed Revelations and asked them a few questions regarding the story, multiplayer and other things. GB: The Assassin’s Creed franchise has come a long way since its inception with the original game, and each new game has offered a lot of new things that the previous one did not have. Will Revelations offer any new features, or will we see some minor tweaks to the gameplay formula, or will you people just stick to what you did right with Brotherhood and AC2? We take risks and try new ideas. On Assassin’s Creed, that’s an element we really focus on. For each title we release, we want to make sure that we have an innovation that makes it stands out. We are integrating in it a really interesting and innovative gameplay. That’s the way we are able to manage the risk of the innovation: we make sure that we keep a good balance between the pillars of our game that we improve and solidify, as well as new elements with which we take risk and try something totally different. We always strive to improve the immersion of being an assassin in our game. An extension of this effort is Ezio’s Eagle Sense. An evolution to Eagle Vision, Eagle Sense is a natural step forward as Ezio can instinctively pick up cues in the environment to analyze a situation and formulate a strategic response. With the addition of Eagle Sense, players will have the ability to focus on a character and visualize where he has been as well as an approximation of where he will go. It also allows you to detect traitors in the crowd. For example, you can scan a crowd to feel the heartbeat of each person and detect who the traitor is. For the linear sequences, Eagle Sense enables players to use Ezio’s abilities and be able to pick up environmental clues to help them find the way forward. One of the many new features in Revelations and is key to consolidating the gameplay pillars is the Hookblade. Hookblade is an Ottoman modification to the classic Hidden Blade that allows you expand navigation and combat options. It improves flow by increasing Ezio’s mobility. It enables free running to be more fluid, speeds it up and makes the overall navigation experience more fun. The Hookblade itself is an eagle head whose beak creates a hook. This hooks up to elements in the environment and enables Ezio to propel himself (or someone else). It’s a very dynamic and versatile weapon which definitively speeds up the free-running gameplay in the game. There is also the new bomb crafting feature. All these different bombs interact with low-levels of the game; basically we are letting players modify the gameplay to their liking. If you prefer to play stealth, you can have a decoy bomb to attract the attention of guards and slip in unnoticed. If you prefer to avoid chases, there is a bomb which propels caltrops on the ground and stops any pursuer. However, there isn’t an infinite amount of bombs. Each bomb must be crafted using components collected throughout the game. More common components are available in shops or in the Assassins dens. Others might be found only in a specific part of town, or by looting guards. We built a system that makes sense for the player: if he needs gunpowder, he knows he will find some at an arsenal. If he is looking for a poisonous mushroom, he will find it in abandoned cisterns. The most powerful components will be even harder to get – requiring the player to reach heavily guarded parts of the city, or through Contract Assignments in foreign cities. GB: Story-wise, Brotherhood did not contribute much to the franchise other than what happened in the end. Will Revelations offer a deeper, richer, more satisfying story? The story of Assassins Creed Revelations is a tale of three Assassins – their histories intertwined in the most astounding ways – coming to terms with the ultimate purpose of their lives. At the heart of their struggles to guide and shape the Assassin Order into a force for good, burns a single nagging question: Have I Done Enough? Over the course of Revelations, we will watch as our three heroes grapple with this problem, and ultimately pass on their conclusions to later generations. Through Altair’s story, Ezio will bear witness to the soaring highs and crushing lows of a man who lived as a devoted Assassin his entire life – how much can one man reasonably accomplish in so short a time? And through Ezio, Desmond will watch a middle-aged man come to terms with a situation he was thrown into after the brutal murder of his father and brothers, all the while wondering, how much of our lives do we chose for ourselves, and how much of it chooses us? GB: A lot of people had many complaints about the campaign of Brotherhood, saying it was not as high quality as Assassin’s Creed II’s campaign was. How do you look to fix that in Revelations? It is no easy task to tell the stories of three incredible characters simultaneously – especially when the timelines and settings are so wildly disparate – but we feel confident and enthusiastic that we have crafted a cohesive, epic tale that honours the tones and themes established by all previous instalments. Altair is still as stoic and philosophical as ever, even in the face of overwhelming odds against him, while Ezio remains a warm and charismatic presence, full of curiosity and love for all who serve the better side of human nature. The biggest challenge for us from the outset was to shape a story that felt natural and necessary, without resorting to any cheap tricks or flights of fancy. We have faith that we have done this, and that fans – old and new – will be thoroughly satisfied (and a tad misty-eyed) with the conclusion we have planned for our beloved Assassins. GB: How will the juxtaposition between Altair and Ezio play out in Revelations? And how much part does Altair play in the game, gameplay-wise and story-wise? For Altair, the full scope of his involvement is something that I’ll have to keep mysterious for the time being. GB: How much of the game is set in the modern world? Will there be more gameplay sections concentrating on Desmond than before? At the end of Brotherhood, Desmond falls into a coma as a result of a traumatic shock to his system. When Desmond “wakes”, he finds himself in a mysterious and surreal dreamscape. Everything he experiences here is a projection of his own mind filtered through the Animus’s circuitry: fragmented memories, symbolic representations of his past and present, mixed with Animus signal streams. Subject 16 remains Desmond’s shadowy confidant, but he is much more forthright about giving him advice and opinions. We think fans will be quite satisfied to see how we have incorporated him into the narrative. As for the full scope of his story, you will have to wait until November 15th. GB: Which features from previous game will be making a return in Revelations? You can call on your brotherhood for assistance during a fight or to assassinate a target. Assassin recruits were an appreciated addition the game, but players provided us feedback that they didn’t feel a particular attachment to them and would have preferred a deeper character development of sorts. In Assassin’s Creed Revelations, we are giving your assassin recruits more personality, making them more meaningful to the player. There are more options to customize the assassins by selecting their weapons and their class. We also added more missions related to the assassins: new recruitment missions, as well as missions when they reach specific levels in their progression. That brings me to the second main change that we made to the Assassin’s guild. Since Ezio is more mature in our game, he needs to prepare new master assassins. He won’t be there forever, so he wants to make sure he has followers ready to pass the torch to them. 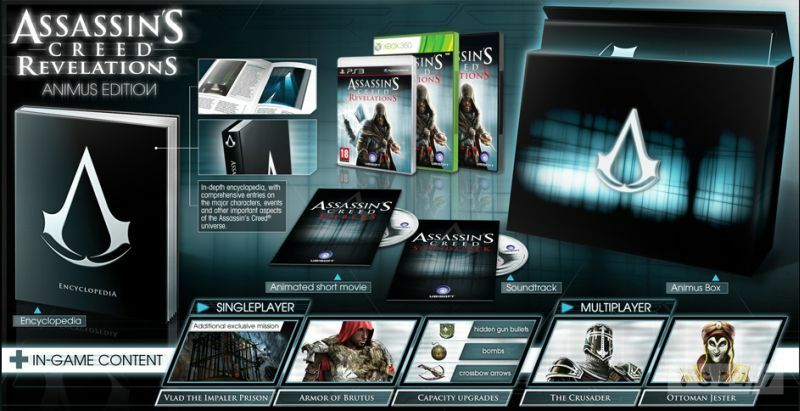 The player will be able to promote his preferred Assassins enabling them to reach the Master Assassins level. We also improved the Guild Contract Assignments. The Assassins you send away are not just completing missions: they can now take control of foreign cities. This will provide the player a steady stream of rewards, but will also attract the attention of the Templars who will try to regain control of those cities. Related to your brotherhood is the Assassin’s Den a new feature, built from the ground up for Assassin’s Creed Revelations, where you gain (and lose) control of Constantinople’s districts. It best represents the battle that is fought in the streets between the Assassins and the Templars. It’s very organic, so a district that is controlled by the assassins can be attacked by the Templars and then taken back and vice-versa. Other elements mark a return but are integrated to consolidate the gameplay pillars. For example, Ezio has access to a parachute but can now release it and hook himself to a zipline and then assassinate a soldier. It’s all about systemic integration which enables, in this example, to bridge free-running and combat more seamlessly. GB: Brotherhood’s multiplayer component was surprisingly good. Will you build upon that in Revelations and try to make it better? If yes, then how? 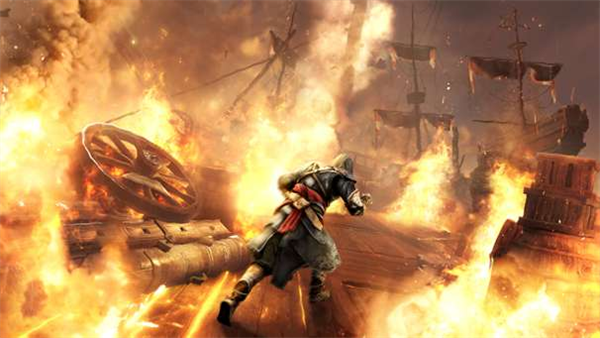 There will be many improvements in Assassin’s Creed Revelations. The main changes you will notice first are the new setting, cast and maps. We spend a lot of time observing and talking about the favourite characters and maps with the community, and we have learned a lot. We have improved access to the game and matchmaking. We also wanted to add tons of new elements, so along with the new modes, abilities and streaks, you will discover a brand new customization features. There is also a new animation system with custom kills and taunts that you can combine together. Put that on top of new mechanics that will allow you to go for a rapid stealth kill or a long brutal and spectacular assassination and you will start to get an idea of the new Assassin’s Creed Multiplayer experience. On the multiplayer side, what we really wanted to add an element that is a core part of Assassin’s Creed that wasn’t really pushed in Brotherhood, namely a strong story. In Revelations, players will assume the role of a Templar in training. As you progress in the multiplayer, Abstergo management will contact you and give you insider’s information on the company and explanations on their operations. It is the first time we will get to see the Templar’s side of the story and our fans are in for a treat!